Beautiful green cliffs and vertical valleys characterise Reunion. Right to the edges, the volcanic rock forms an impossibly dramatic landscape - and the interior must be awesome with three giant "cirques" or giant calderas as if giant ice cream balls have been scooped out of the top of the island. It's easy to compare this to Kauai- with its absence of coral reefs and awesome surf pounding against the exposed yet verdant formations, and an interior that is virtually impenetrable. We didn't see much of the interior at all - short visit - but what an amazing place to see. There's a huge population considering how so much of the island is uninhabitable, and wide beautifully paved autoroutes belt the whole thing. It's a full department of France, and I can definitely see why this would be an island to hold on to! Back in Tana we visited the Lemurs' Park and saw many more different species of Lemurs that we had not seen in the national park. The Lemurs' Park is a charity that has been set up by French and Japanese organisations- here the lemurs roam freely but they are fed everyday. My favourite were the Coquerel's Sificas- the dancing lemurs! 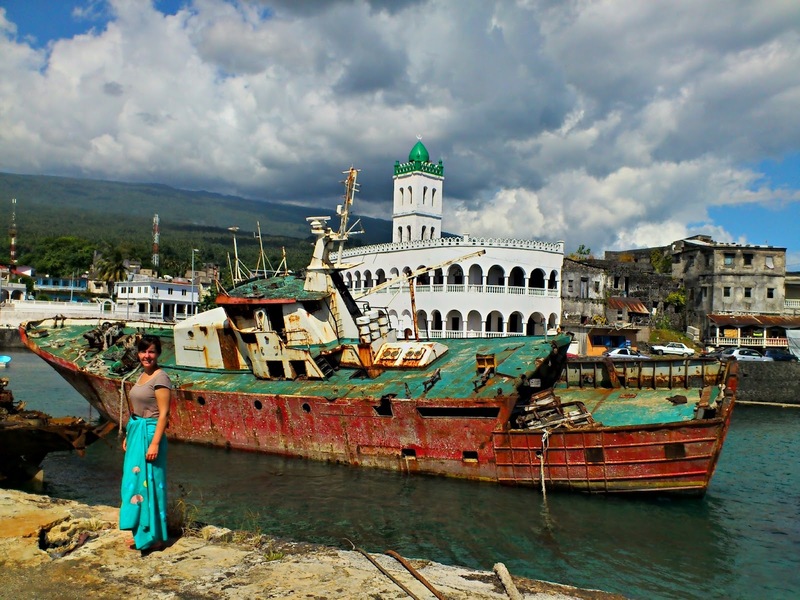 With only about 3000 tourists a year, visiting the Comoros is definitely special. The spotless beaches, clear warm water, and gentle people make it an amazing destination. No, there's not a whole lot of tourist infrastructure - not anymore anyway. There's some relics of an international-class hotel on one of the northern beaches - but with well over 20 coups d'etat in about as many years, the investors have long since been scared off and the the 5-star bungalows are now squats. Nice squats, mind. We arrived on the island of Grand Comore via Mayotte - the fourth of the four islands of the Comoros. At least that's what the Comoro government insists. In fact, Mayotte's residents chose to stay with France when Comoro negotiated independence in 1975, and the alignment was strengthened even more with a referendum in 2009 as some 95% of the residents opted to go all the way and change Mayotte's status to a full-blown Department of La Republic Francaise since 2011. This deeply annoys the government in Moroni - and there's plenty of propaganda posters everywhere asserting that Mayotte is part of Comoro blah blah blah. Sounds a bit like Argentina and the Falklands - or even Ireland. Hmm. What is for sure is that Mayotte is about a million times more developed than anywhere else in the islands - fancy new airport, booming tourist trade, package holiday super resorts - the lot. I don't envision the French capitulating too too quickly to the Comoro requests. But then again - who knows... things can always change! What's also for sure is that the Comores are an amazingly rewarding place to visit. Just awesome. The choice was a French island with French prices but a European infrastructure (think Bora Bora, Reunion) or an island that has had many coups in the last few decades and no tourist infrastructure. Of course whilst I was sleeping, Ty went ahead and sorted out flights to spend almost a week in the latter! In the end I was glad that we did. As we drove along pot holed roads, past half finished concrete buildings and rubbish piles, we made it to the most beautiful beaches- and there were no tourists there. Our own private beaches with incredibly clear turquoise water, white puffy sand and coconuts. There were even orange butterflies fluttering on the beach. Pure paradise! Fascinating to see the coelacanth fish in the national museum- which is one of the oldest known living fish. It is thought to have evolved in its current form over 400 million years ago. Wow! At our hotel (the only hotel in town to have a wifi connection)local dudes would sit on their roof across the street on plastic chairs to snaffle the internet. The internet was so slow that it took two whole days to upload a video. Everyday there were power shortages, so it was surprising that the video even uploaded in that amount of time. Apparently Carl Linneaus named "lemurs" after a sort of mythical undead ghost - understandable given of their haunting cries and lithe human-like forms. Having split off from the line that would evolve into monkeys, apes and humans on the isolated island of Madagascar, lemurs are creatures that seem somewhat like a strange cross between a squirrel, a monkey and a panda bear. Running around in the jungle for a whole day from daybreak until the afternoon we found four types of lemurs (Indri, Diademed Sifaka, Bamboo Lemur and Common Brown Lemur) and an amazing diversity of other animals. As the sole campers in Madagascar's Andasibe-Mantadia National Park, we got an early start with our excellent guide, Herman. He could effortlessly spot and track down lemurs, tiny toads, even tinier chameleons and even an impossibly well-camouflaged leaf-tailed gecko. After spending a couple of nights in the unremarkable capital Antananarivo, we took local transport (taxi brousse) to the town of Andasibe. Upon arrival we set up our tent in the well maintained camping grounds right next to the national park office. No one else was camping and for the first time I really appreciated and enjoyed the camping experience- out in the wilds. I was pretty impressed with Ty when he made the first night's fire for us to cook our dinner on with only a lighter, leaves, wood and toilet paper! The 6 hour walk through the forest was awesome and definitely an adventure. At times we quickly moved through the trees and foliage following our guide Herman who had tracked down the lemurs. After hearing the indri's cries from a few kilometres away, it was great to finally see them in their natural environment. They were incredibly cute looking- like panda koala bears. However, the best moments came when Herman found some diademed sifikas who were low on a tree, literally a metre away from us. One even gave us a cheeky display, hanging upside down and staring Ty right in the face. Even Herman looked pretty chuffed. It really was an incredible experience and I felt very lucky to see four different types of lemur and so much other wildlife here.